I like playing around with chocolate recipes. A few weeks ago I decided I’d try to make a healthy white chocolate recipe. Just cocoa butter, honey, and vanilla. It tasted great while I was mixing it. But then as soon as it cooled, the honey separated out! I tried melting and blending it again with the same results. I realized that mixing honey with cocoa butter requires some sort of emulsifier. Not a commercial emulsifier; just some additional substance to bind the honey with the cocoa butter. In my homemade Paleo chocolate recipe, for instance, cocoa powder works as an emulsifier. I decided to try adding peanut butter to my white chocolate, and it was a success! No more problems with the honey separating out from the cocoa butter. Now, peanut butter white chocolate wasn’t exactly what I was originally going for, but it was so good that I’ve made it a number of times since. The peanut butter and cocoa butter play off each other to create a delicious combo. This recipe is simple and easy–I hope you give it a try! Cocoa butter is the fat found in cocoa beans. It’s used in most commercial chocolate and has a delicious flavor and texture. Like coconut oil, cocoa butter is also a very healthy fat. When it comes to making chocolates, cocoa butter has one distinct advantage–cocoa butter chocolates will not melt at room temperature! I love coconut oil chocolates as much as the next person (and have developed quite a few of my own coconut oil chocolate recipes), but I also really like having a homemade chocolate recipe that can be stored on the counter, given away as gifts without having to worry about refrigeration, or thrown in my purse when I’m in need of a chocolate pick me up when out and about. The raw version of cocoa butter is called cacao butter. I personally use cacao butter in my recipes, because it’s supposed to contain more nutrients, but you can use whatever you prefer. Cocoa/cacao butter may not be an ingredient that you normally keep in your pantry, but it’s really easy to find when you know where to look. Health food stores like Whole Foods will likely carry cacao butter, but I always buy my cacao butter online because it’s MUCH cheaper online. My current favorite is this cacao butter, but that’s mostly because it’s the best price I’ve seen. I’ve tried a number of other brands and they’ve all been delicious! To prevent your chocolate from seizing, make sure that all the equipment and tools you use are completely dry. Exposing your chocolate to small amounts of water can cause it to seize. I also recommend melting your cocoa butter in a double boiler, instead of directly in a saucepan. Letting your chocolate get too hot while melting can also cause it to seize. When you remove the double boiler from the saucepan, place it on a towel on your counter and dry the outside of a double boiler before you pour your chocolate into your baking dish to cool. This will eliminate the possibility of dripping water into your cooling chocolate. This makes mildly sweet peanut butter chocolates. If you prefer your treats sweeter, you can add more honey to taste. I’m listing cocoa butter in this recipe, but I actually use raw cacao butter myself. Either can be used interchangeably here. I list cocoa butter in grams here, because most cocoa butter comes in big chunks and it’s impossible to get an accurate volume measurement. I use my kitchen scale to weigh my cocoa butter. If you don’t have one already, I have this one ; it’s inexpensive and has worked well for me for the past several years. Immersion blender: I highly recommend using an immersion blender to mix your peanut butter white chocolates. While you probably can do this by hand with a whisk, I find that the immersion blender does an excellent job of quickly and thoroughly mixing your honey in with the rest of the ingredients. I have this immersion blender. Silicone chocolate molds: For optimal aesthetics, I recommend using silicone chocolate molds. I used this set of molds, which are very economical but still high-quality, as far as I can tell. If you really get into making your own chocolates, I highly recommend owning a small collection of silicone molds–they make the process very easy, plus they’re cute! Melt your cocoa butter in your double boiler. Once it's completely melted, turn off the heat. Add your peanut butter, honey, vanilla, and salt. Use an immersion blender to thoroughly mix all ingredients. While you can do this by hand with a whisk, I highly recommend using an immersion blender, as it does a superior job of blending the honey in with the rest of the ingredients. Taste the mixture to make sure it's to your liking. I think the recipe is delicious as written, but you can add more salt and/or honey if desired. 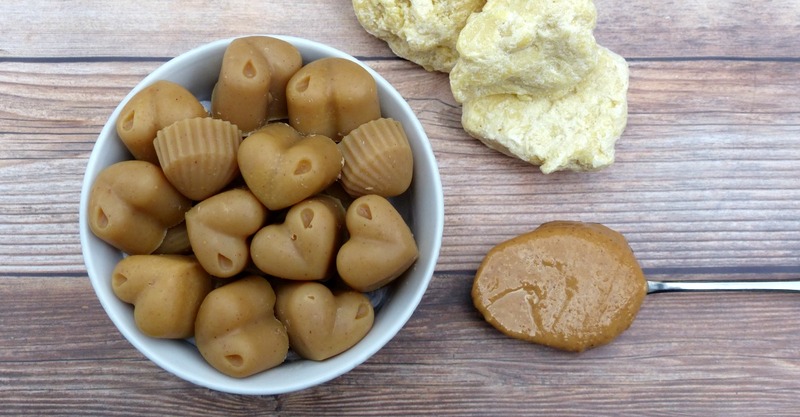 If using silicone molds, ladle peanut butter white chocolate mixture into your molds. If not using molds, line an 8x8 glass baking dish with parchment paper. Pour the peanut butter white chocolate mixture into the dish. Cool chocolate in the fridge. Once hardened, pop out of molds, or cut into chunks if you used a baking dish. Store finished peanut butter white chocolates in the fridge or freezer. You can also store them at room temperature, but I find that they taste best when they're cold! Are you looking for an easy way to add more coconut oil to your diet? Give these chocolate coconut fat bombs a try. They taste like chocolate candies, but they’re actually good for you! You know I’m all about the simple recipes, and this one is no exception. Just combine five ingredients in your food processor, freeze, and enjoy! What type of coconut oil should you use? Since I became gluten-free more than six years ago, I’ve been on the search for the perfect homemade gluten-free bread. This search became much harder when I discovered that I also can’t eat eggs. The vast majority of gluten-free breads contain eggs, so a vegan gluten-free bread is a tall order. Several months ago I stumbled upon this recipe for gluten-free, gum-free, and vegan sandwich bread from Cradle Rocking Mama. I made her recipe (with a couple modifications) and was instantly in love. Finally, an awesome homemade vegan gluten-free bread recipe! Did you know that you can make your own healthy homemade chocolate? Homemade chocolate that’s dairy-free, soy-free, AND refined sugar-free? If you’re a chocolate lover, you have got to try this recipe! I’m calling it Paleo chocolate, because it’s the aforementioned dairy-, soy- and refined sugar-free, but don’t be deterred if you’re not Paleo; this is a super delicious chocolate for ANYONE who loves healthy eating and real food. Kefir vs. Yogurt: Which is Right for You? Do you want to add a fermented dairy product to your diet, but aren’t sure whether kefir or yogurt is the better option? Both of these dairy products have their own advantages and disadvantages, and either may be a better fit for you depending on your goals and current lifestyle. Read on as I breakdown the differences between kefir vs. yogurt. Both kefir and yogurt contain probiotics that benefit your digestive health. Kefir contains a larger number and greater variety of probioitcs. It also contains several yeast strains that benefit your digestive system.